Two Below Zero delivers a themed dining experience that offers much more than any Breckenridge restaurant. This is a Colorado experience you will never forget, with views and picture-perfect photo ops! Guests call their dinner sleighride with Two Below Zero the highlight of their vacation. In addition to your horsedrawn sleigh ride, you'll also enjoy a hearty home-cooked, three-course meal, including dessert (gluten free and vegetarian meals also available). Hot cocoa and peppermint schnapps are included. You may also purchase wine and Colorado Beers, if desired. 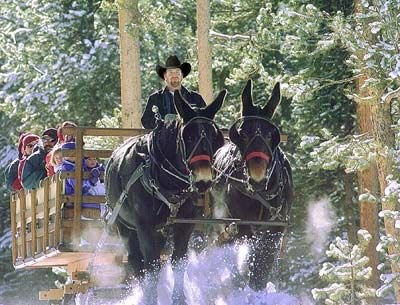 Activity - Rated #1 Sleigh Ride in America!